Active RFID is a form of Auto ID (automatic identification) characterised by the use of ID tags which are self powered. They have their own battery, and typically emit a signal at a predefined rate, usually with an interval of about one second between transmissions. An active RFID tag can typically be read at a range of 100 metres. This compares well against passive tags, where the read range varies according to the frequency of the tag. For LF tags, range can be less than an inch. For HF tags, range can be to a twelve inches. For UHF tags, range can be up to twenty feet. But long range is not always a good thing. In systems where the tag is used as a locator, range can be deliberately reduced, and this is often done by reducing the "gain" of the reader. Effect of surroundings and orientation. The orientation of the tag tends to be less critical for active RFID tags than for passive RFID tags, and the tag is less affected by its surroundings, especially the proximity of water or metals. In fact, testing of systems using active tags can be problematic. When testing we typically use a tin box to shield unwanted tags and make them unavailable to the reader. This is fine when testing for passive RFID Tags, but when testing many Active RFID tags we find they can be read even when placed in a tin box with a closed lid. Of course, in theory this is not possible, but if the lid is less than a perfect fit, enough signal leaks through to give a reading. This has obvious implications in real world deployments, meaning that an accidental partial screening of a tag can be accommodated without the tag being unreadable. Disadvantages include cost, size, life, operating temperature range. Depending on type, manufacturer and quantity, as a general guide assume that an active RFID tag is going to fall in the range $5 to $40 each. This compares to $1 to $3 for HF tags, and 50c to $6 for UHF tags. (Prices are changing rapidly, these are rough numbers as a general guide). Active RFID tags are generally larger than their passive counterparts. 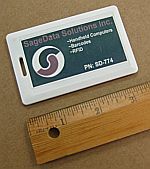 An active RFID tag can be in one of several formats. In credit card format, it is typically the thickness of four or five credit cards, say 1/8 inch or 3mm. More commonly it is in a format two or three inches long, perhaps 3/4 wide and 1/4 inch thick. Construction is usually sealed, and tags vary in how robust they might be. This can be compared with passive tags, which vary in size according to frequency. - An LF RFID tag is perhaps the size and shape of a beer bottle cap, although tags in the form of a "plastic nail" are sometimes used where appropriate, especially for identifying trees. LF tags are also seen in the familiar ear-tag format used for tracking livestock. - An HF RFID tag is commonly packaged as a credit card, typically used for building access, but can also be incorporated into a key fob, as with the tags used to "pay at the pump". - UHF RFID tags are smallest of all, due in part to their construction, which requires printing on only one side of the laminate. So UHF tags are typically three or four inches long, between 1/4 inch and one inch wide, and less than 1mm thick, though many smaller formats are available. The life of an active RFID tag is limited by the battery. Manufacturers claim typically five years. In many cases the battery cannot be changed, and the tag must be discarded at end of life. The upside of this approach is that reliability is increased. Most systems have the ability to determine the status of the battery in each tag. Often, battery condition is transmitted along with the regular beacon signal. The life of a passive RFID tag, in contrast, is theoretically unlimited, determined only by the reliability of the components. The strength of the Active RFID tag comes from its on board battery, but in some circumstances that can also be a weakness. At extreme low temperatures the chemical reaction of the battery is slowed, and the tag becomes unresponsive. Normal performance generally resumes when the tag is warmed. Depending on the design, tags can work down to minus twenty degrees Celsius. Active RFID tags are commonly used for tracking high value assets over a large area. They might be used for tracking vehicles in a lot, or for tracking valuable items or essential equipment within a building. They are particularly useful when items need to be tightly controlled. When managing and monitoring items in a controlled area, there are two viable approaches. Choke points can be set up at access and entry locations, to detect items entering or leaving. Alternatively, readers can be set up to constantly monitor all items. There are strengths and weaknesses in each approach, and it is difficult to give a general recommendation, as the better solution depends on many external factors. We are happy to provide more detailed information for specific cases. Coverage can be affected by many external factors, and there are some key issues to be followed in selecting the best location and mounting technique for the readers. One common error is to mount the readers close to a metallic conductor (even the support strips for ceiling tiles can degrade (or sometimes enhace) coverage). Also, read range is dependent on the tag type, and ideally reader mounting should be adjusted to accommodate that. More information is available on request, again the most effective approach is often determined by the specifics of a given installation. In the real world a system has to accommodate many realities. Usually there are a limited number of assets that need to be continually monitored, either because of their high value or other security requirements. But there is often a larger quantity of items that also need to be tracked, but where time is less critical, or cost of active tags is difficult to justify. In these cases a hybrid system can be installed. This can use a combination of Auto-ID technologies - barcodes, passive tags and active tags to provide the most appropriate solution.